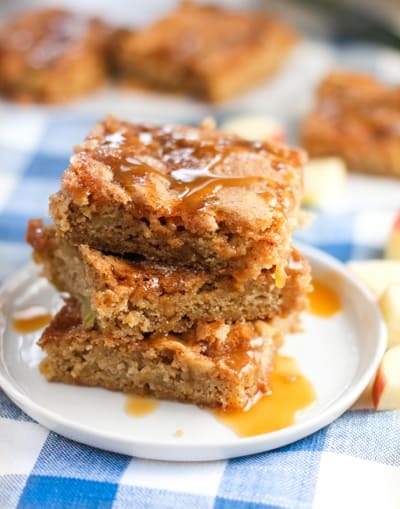 Whip up these delicious Apple Bars in just a few minutes…using one bowl! This is the perfect recipe for those fixer-upper apples you have hanging around but just can’t throw away! This is a one bowl recipe that you can bang out in a just a few minutes. I topped it with caramel sauce from a squeeze jar. Hey, it’s okay, the bars are homemade – a little store bought caramel sauce isn’t gonna kill ya. Oh, and you can easily double this recipe…some for you…some for a friend. You saved an apple today and all is well in the world…. 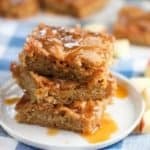 One Bowl Apple Bars are so easy and so delicious! Preheat oven to 350 degrees F . Grease a 9x9 inch pan. In large bowl, mix together flour, baking powder, salt, and 1/4 teaspoon of cinnamon; set aside. Make a well in center of dry ingredients and add melted butter, brown sugar, and 1/2 cup of white sugar, egg and vanilla. Mix wet ingredients inside the well of the dry ingredients slowly incorporating dry with wet. Stir in chopped apples. Spread the mixture evenly into the prepared pan. In a cup or small bowl, stir together the remaining cinnamon and sugar; sprinkle over the top of the bars. Bake for 25 to 30 minutes in preheated oven; finished bars should spring back when lightly touched. Cool in the pan, and cut into squares. I used store bought carmel sauce to finish it all of!! Yum! I’m so pleased I found your website – your photos are just wonderful. Hello Emma! Thank you so much, you made my Sunday with your sweet comments! 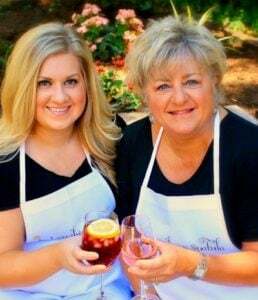 These sound delicious Kathi! I love that this is only 1 bowl. The less cleanup the better! And great idea putting caramel on top. I just so happen to have a bunch of apples needing to be used up. Yum!